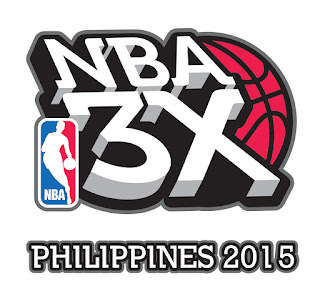 Manila, Philippines, 30 August 2015 – Personal and team Grand Slams marked the fifth consecutive NBA 3X Philippines 2015 at the SM Mall of Asia Music Hall as EGS Team won the championship three years-in-a row in the Men’s Open Division and Team Alcaraz again dominated the Celebrity Division for the third consecutive year. Celebrity Division champs, Team Alcaraz made up of (from left) Rambo Nunez, Marco Alcaraz, Jose Sarasola and Derick Hubalde, flash the "3" sign after their Grand Slam feat in this division. EGS – with Ian Garrido, Rocky Acidre, Rutger Acidre and Mark Anthony Doligan -- beat Double Play, 21 to 15, via strong defensive play and awesome rebounding, while Team Alcaraz, made up of TV personality Marco Alcaraz, Rambo Nuñez, Derick Hubalde and Jose Sarasola, defeated the Derek Ramsay-led Team Ramsay with smart play and a flurry of outside shots. In the individual category JC Baltazar of the Ateneo de Manila was three-time KFC Bucket 3-Point Shootout King and David Carlos again reigned as NBA 3X Philippines Tattoo Slam Dunk champion for the third time. More teams established credentials in other categories. Animo Greenhills beat Ball is Life in the Boys Under 18 division, earning back-to-back NBA 3X crowns even as they moved up two age divisions to keep team members intact. Jr. WNBA All-Star 2015 alumni Panki David, Mika Pentecostes and Kyla Flores won the Girls Under 16 title with classmate Sam Solosa, beating the Lady Conquerors in a fast-paced game. Team adidas, made up of varsity players of the College of St. Benilde – Kat Merilo, Tiffany Ngo, JP Gula and Nel Sinsioco – defeated the Wildcats in the Women’s Open in a tough and physical game. The Open Champions—Men and Women – were rewarded with the chance to take part in the adidas Grab for Charity where they could grab all the adidas merchandise they wanted at the SM Mall of Asia adidas store within a 30 second period. The NBA donated the equivalent amount of the winnings in the adidas store – PhP 150,000 -- to World Vision. This is the second consecutive year that the NBA is donating an equivalent amount to charity. In the Boys Under 13, Kabaka defeated Ink for Less 13-11 while the Bagoong Republic beat the Teammates, 13-9 in the Boys Under 16 division. David Carlos, two-time Slam Dunk champion, defeated Jr. NBA All-Star and varsity Slam Dunk king, Ricci Rivero, getting 10’s from judges Danny Green, Kenneth Faried, Patrisha of the Warriors Dance Team, Carlo Singson, NBA Asia Country Manager, Philippines and Jinno Rufino of Basketball TV. Denver Nugget Kenneth Faried is wowed by a young baller. 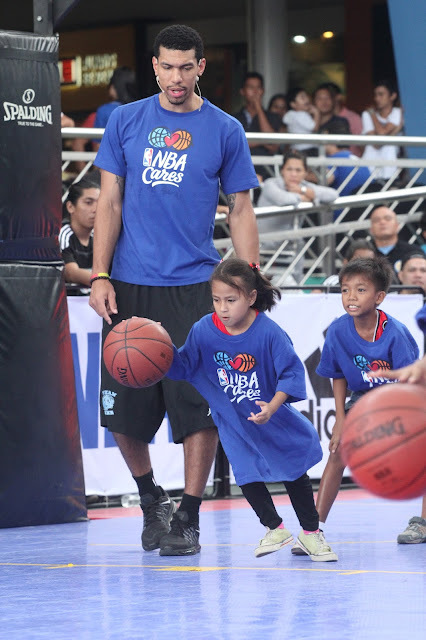 Danny Green guides a young World Vision kid in the ways of basketball in the NBA Cares activity of NBA 3X Philippines 2015. A team of young players had the once-in-a-lifetime experience of playing 3-on-3 with Kenneth Faried, Danny Green and Lester Doone of the NBA at center court. 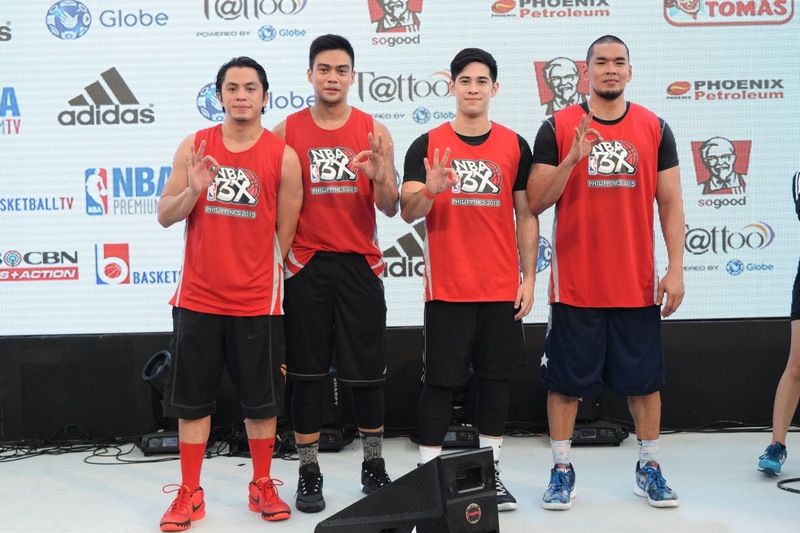 The young team held their own against the power team of NBA personalities. The three-day NBA event was experienced by a huge mall crowd that gathered from Friday to Sunday at the Music Hall, as the the Golden State Warriors Dance Team thrilled them with high-energy half-time numbers and Franklin the Dog made them laugh with his funny antics. 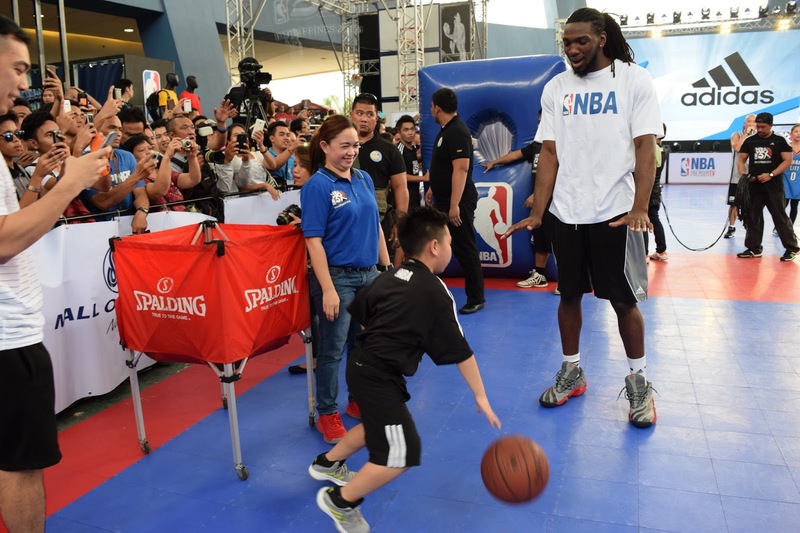 Faried and Green also interacted with the crowd and Green conducted an NBA Cares activity with the children of World Vision. The official partners of NBA 3X Philippines 2015 were adidas, Globe and Tattoo powered by Globe, KFC and Phoenix Petroleum with SM Mall of Asia, Spalding and Mang Tomas. 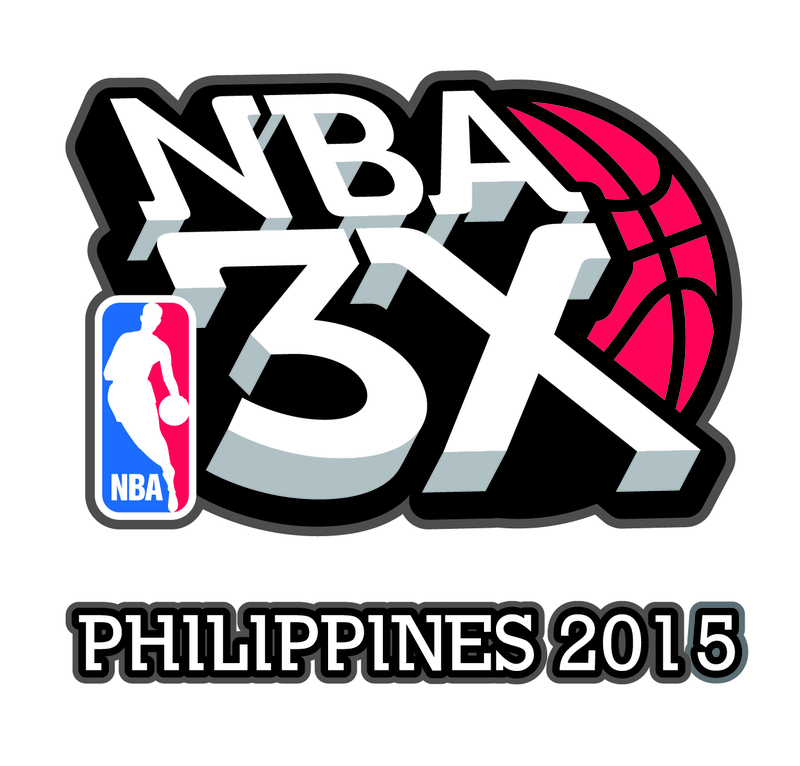 Official NBA broadcasters were ABS-CBN Sports and Action, BTV and NBA Premium TV. The Golden State Warriors Dance Team work their magic on the SM Mall of Asia crowd.